Get your cape on with WONDER WOMAN, SUPERGIRL, BATGIRL and all the other DC Super Hero Girls in this deluxe reusable sticker book! Get your cape on with the DC Super Hero Girls, the unprecedented new Super Hero universe especially for girls! 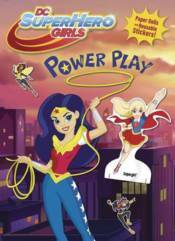 Younger fans can have a blast designing new super hero costumes and applying new accessories and gadgets to Wonder Woman, Supergirl, Batgirl, with reusable stickers, and acting out their adventures against backgrounds, decorating their lockers and dorm rooms, and more in this awesome activity book!